“Keep calm love Man Utd, everyone” is the message being sent from one of the greatest clubs in the world. No need to panic. While life may have been frustrating after the departure of Alex Ferguson, things haven’t exactly been all that bad. Manchester United is still one of the best clubs in England and is worshiped all over the world. And to kick start it towards another golden age the team has adopted new battlegear that pays homage to great Manchester sides from the past and to the club’s greatest icons. 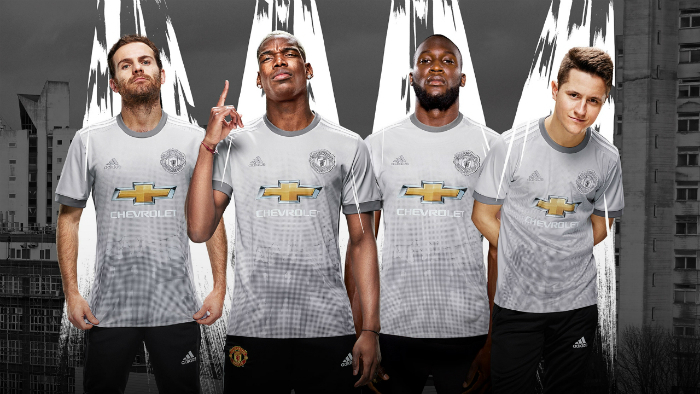 Let’s examine United’s visual identity, from home kit to fan apparel. They are nicknamed the Red Devils and while one may have to look very closely to find any evidence of horns, every red blooded supporter of Manchester United knows where the colour red can be found. The shirt. The United jersey is the staple of the team allegiance and often the most prized possession of a true fan. This version of the club’s battlegear does not disappoint. Featuring a sophisticated, elegant design, the current Manchester United shirt has a more contemporary look than that of the previous season, in accordance with the evolution of football fashion. It is sleek, form hugging and uniformly red. The three Adidas stripes have been moved from under the arms to the shoulders in homage to the classic shirts from the 80s, when Bryan Robson, Mark Hughes and Steve Bruce were playing for the club and the legendary Alex Ferguson was starting United on the most memorable path to greatness. Those were the first years of the union with Adidas and they began a partnership that saw some of the most spectacular triumphs in football. 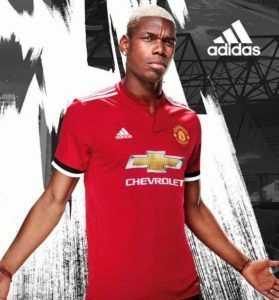 The ever-present Adidas logo appears as expected on the Manchester United jersey, still in white and on the right breast. It is pressed onto the game jerseys and woven onto the fan replicas. Underneath is the large and highly noticeable logo of the team’s sponsor – Chevrolet – which never truly blends properly into the shirt and creates some jarring visual contrasts, but is the price of doing business in today’s football world. Yet any commercial melancholy is quickly dispelled with a swift glance up and to the right, where one can find the holy grail of Old Trafford allegiance – the Manchester United crest. It is one of the most recognizable symbols in the world today and provides the right dash of yellow right over the heart. The two biggest additions this year are the collar, which is taller around the neck with buttons at the front and the black stripes around the sleeves. The stripes add black touches to the jersey to match the red, white and black flags that wave passionately on matchdays at Old Trafford. With the wall of de Gea in net, the virtuosity of Pogba and Mata in midfield and with the finishing touches of Lukaku and Martial in attack, this is the jersey that the opponents of Manchester United have to face this year. With symbolic visual ties to late 80s, when the last golden age was about to begin, the Red Devils are poised to battle their way into history books once again. There is legacy and talent here, as well as some of the most passionate fans in the whole world. Will it be enough? Manchester United kit is made by Adidas and it uses its advanced manufacturing technology. The German sportswear giant conducts research in how their products affect athletes and uses the resulting data to improve them. Consequently the uniforms of United feature the best Adidas has to offer. These days, it means the Adizero and the ClimaCool technologies. The official uniforms that the Manchester United players wear on the pitch feature the ADIZERO innovation. They are constructed to be lighter than other garments and this is achieved by removing weight from the fiber itself as well as by replacing heavy elements – like embroideries and trims – with lightweight variations that are just heated on. This creates a comfortable, breathable kit that evaporates sweat much faster. CLIMACOOL can be found in the fan replica shirts of Manchester United and it features breathable fabrics and mesh engineering. This creates strategic spots of micro-ventilation which keeps the person cool. The fabric also pulls the sweat away from the body to the outside of the garment, where it can dry faster. Keeping with tradition, the shorts that form the home uniform of Manchester United are white. They are made of 100% polyester (like the shirt) and have an adjustable waist. They feature the same technologies as the tops and have the three Adidas stripes running down the sides, this time in black. The crest of the team appears on the right leg. The socks are black, with a red and white stripes and a stylized red devil on the shin. Man United also has the black versions of the shorts which are worn usually with the away kit but can be paired up with the red shirt on occasion. If the home kit hints at the beginning of the club’s greatest years, the away one shouts it from the rooftop. Simply put, it’s the modern take on the 1990-1992 strip when the bold graphic patterns were the standard of football shirt design. Those were the very years when under the leadership of the legendary Alex Ferguson the club rose to greatness once again. They heralded the arrival of a new era of Manchester United that would last for over two decades. While the shirt does have modern touches not present in the early nineties, the fans of United will recognize the strong influence of the blue jersey from the 1991 European Cup Winners Cup run and the 1992 League Cup final against Nottingham Forest, when the likes of Ryan Giggs, Mark Hughes, Steve Bruce, Gary Pallister, Denis Irwin and Peter Schmeichel played for the club. This new version is a mix of black, gray and white and it creates a striking visual pattern, especially from a distance. In contrast to the home jersey, its only dash of colour is the Chevrolet logo, while the lettering and the club crest are black and white. The back is uniformly black, as are the bands around the sleeves and the crew-neck collar. The Adidas three stripes are once again under the arms. These days, the third kits of professional football clubs are often created for the fans. Some teams design them to resemble streetwear, while others add specific elements that have special meaning and appeal to the club supporters. 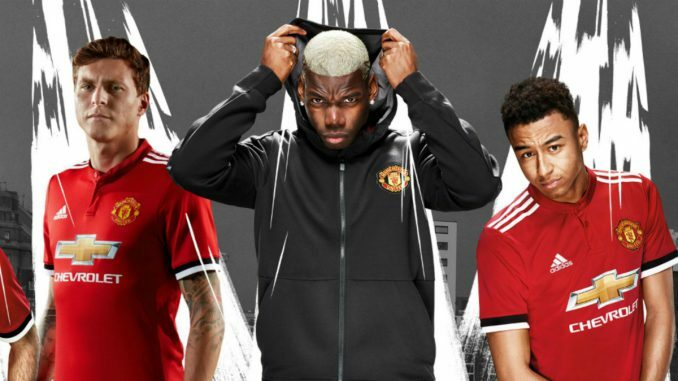 Adidas took this concept a step further and created a contest to design Manchester United third shirt. Using Football Creator Studio, United die-hards from all over the world submitted their designs and then voted on them in a “battlemode” format. The design by Aniello Carotenuto was ultimately selected. This choice is now the team’s third kit. At a first glance, the third shirt appears as just another variant of a light gray jersey, but the real fans of the club will instantly recognize symbols of club pride. Watermarked on the front of the shirt is the famous “United Trinity” statue outside Old Trafford. 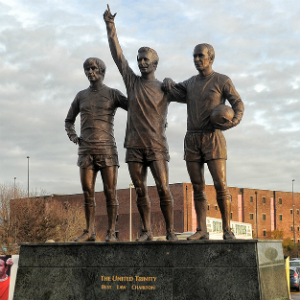 It depicts club icons Sir Bobby Charlton, George Best and Denis Law which represent a golden era for the club. As such, the third shirt is another touch of inspiration for the team. Just like the home and away strip, it reminds the fans of the rich and unique history of the club and brings hope for future greatness. The trim of this iconic shirt is darker gray – specifically the collar, the sleeve bands and the club’s crest. The only dash of colour is provided by the Chevrolet logo. The shirt does well on the pitch but it truly shines as a fan shirt and perhaps a collectible. It is accompanied by white shorts and gray socks when Manchester United takes the field. Adidas makes two versions of the official Manchester United tops – authentic and replica. The authentic version is what the players wear on the field. They feature the Adizero innovation and are very light weight and quite durable. They are also quite form-fitting and are designed for an athlete’s body in his prime. They are available to fans, but are the pricier option. Instead, the fans are encouraged to buy the replica jerseys, which look almost identical to the authentic ones but have a few small differences. For starters, they are more loose-fitting and more forgiving to different body types. Additionally, they don’t feature the Adizero innovation but have ClimaCool instead. They are also more affordable. For every true fan, wearing a jersey of Manchester United is the pinnacle of club pride. To show your own allegiance to the Red Devils, grab their official home jersey from Subside Sports. For other United fun stuff, have a look a the link below. GET Manchester United APPAREL, COLLECTIBLES AND FAN GEAR! Manchester United is an English Premier League club located in Old Trafford, Greater Manchester. It is one of the most widely supported clubs in the world and one of the most valuable brands in football. 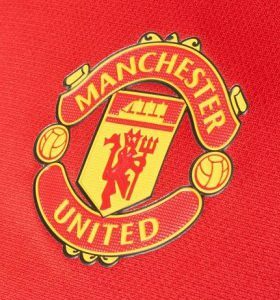 Manchester United was established in 1878 and was known as Newton Heath LYR Football Club in the first 24 years of its existance. The club has won a record 20 Premier League titles, 12 FA Cups, 3 UEFA Champion League trophies and 1 UEFA Europa League cup. In 1999, it became the first English club to achieve the trebble (Premier League, FA Cup and UEFA Champions League) and one of only five clubs to have won all three main UEFA club competitions. It plays its football at Old Trafford. Let us know what you think were the Red Devils best years. Can the club recover its glory? Leave a comment below! The article on introducing sports kit was very clear and very detailed. It let me understand how to choose a good sports kit for my children. Thank you for your experience. Like your post. I can see that you’re true fan of Champion League. I sure am. Thanks for the comment! This is one of the best posts i have seen commemorating a football team that is obviously close to your heart. What better than the team shirts to really motivate fans to come to your website, i believe that this will be a big hit when the football seasons kick off. Indeed. Manchester United is one of the most supported clubs in the world. I am glad you liked it.